PALL Deputy in Tshopo Province. Robert first heard about conservation in his village, not far from the Okapi Wildlife Reserve (RFO). Robert’s father – the headmaster of a local elementary school –recognized the significance of conservation. “My father told us now the world is going in a direction where conservation needs to have an important role. You should learn about this. In my time, I couldn’t go to university, but you have the opportunity.” And Robert listened to him. Robert was born in 1979 in the Province Haut-Uele. 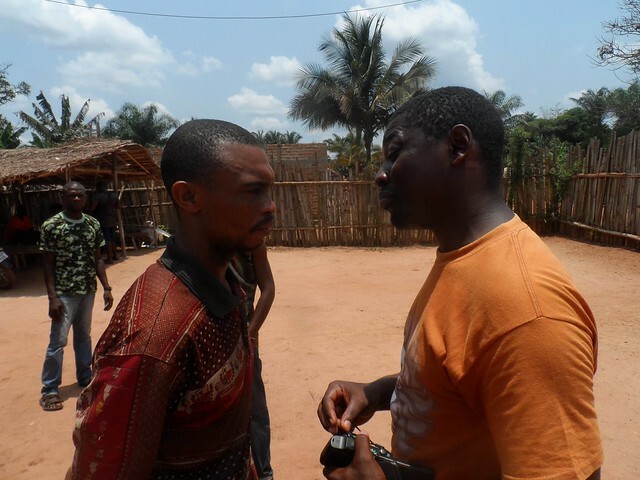 Robert studied Ecology and Natural Resource Management at the University of Kisangani. He met the TL2 teams when working for the NGO, SOS Nature. 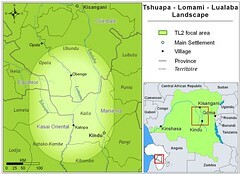 The TL2 project and SOS Nature collaborated in the northeast buffer zone of the Lomami Park. Later, Robert worked with the TL2 project to understand the exploitation of African grey parrots in and around the Lomami Park. When in 2014 SOS Nature closed down, he asked if there was an opening in the TL2 project. TL2 was looking for someone to support Léon Salumu in the northern landscape. Robert started work in 2015. Robert is based in the north of the park in Tshopo Province, where he fights environmental criminality as part of the PALL program. Robert works in close collaboration with the “project ambassador”, Léon Salumu. Because elephants are concentrated in the northern part of the park, ivory poaching is a major preoccupation. Robert’s responsibilities include finding and having arrested the main people involved in the ivory crime network. It is dangerous work, he knows the risks well, and works undercover. With the help of informants operating in villages, markets and along main travel routes PALL has succeeded in uncovering and dismantling criminal networks. The most difficult part of Robert’s work is when he starts a new operation. He has to make sure that it was not false information from an informant, before he calls the authorities; otherwise he risks his team’s and his own credibility, and it reduces the efficiency of the project. Every time there is a new line of information, he becomes tense. And there are the dangers, for instance, the possibility that the arrested person was working for someone really high in the system. He imagines in the future he will continue with law enforcement. He is not sure if there is a way to completely stop poaching activities. But what he wants is to get in front of the poaching. Now he works after the crime—for instance after an elephant is shot and the ivory is hacked off. He is not happy with this. He wants to get to the poacher before he pulls the trigger. He often wonders how he could do that. To really protect the animals, and not just take action after they are already dead. That is his vision, and challenge for the future. Robert has a little daughter and a son, and he is raising them with his wife in Kisangani. His elder brother, Benjamin also studied at the Faculty of Science, Renewable Natural Resources. Robert supported his studies. He believes conservation starts at home. “You won’t find bushmeat on my plate, in my house” – he says.